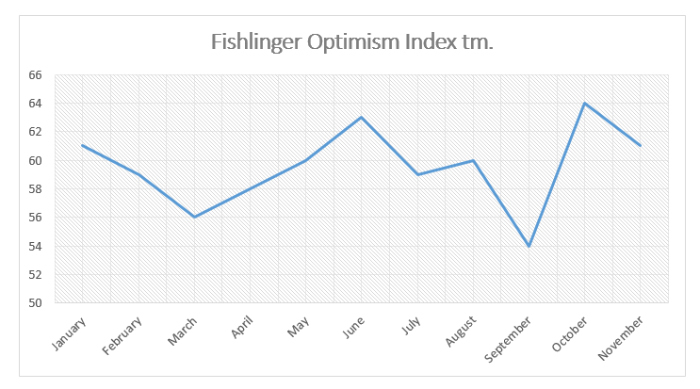 The Fishlinger Optimism Index™, a breakthrough measurement of public opinion centered on Americans’ optimism about the future from the Fishlinger Center for Public Policy Research at the College of Mount Saint Vincent went from 64 in October to 61 in November of 2018. The data collection period occurred right after the stock market correction, bomb threats, and synagogue killings. Also, Judge Brett Kavanaugh was sworn in as a Supreme Court justice. All these events, as well as the outcome of the midterm congressional elections, undoubtedly affected the November results. The turnout for the midterm congressional elections was high for both Democrats and Republicans. The Fishlinger Center projected that the turnout among those eligible to vote would be between 44 and 48%. It was actually 49%. During this period, National Leadership went up from 44 to 53 while Personal Prosperity went down from 62 to 53. 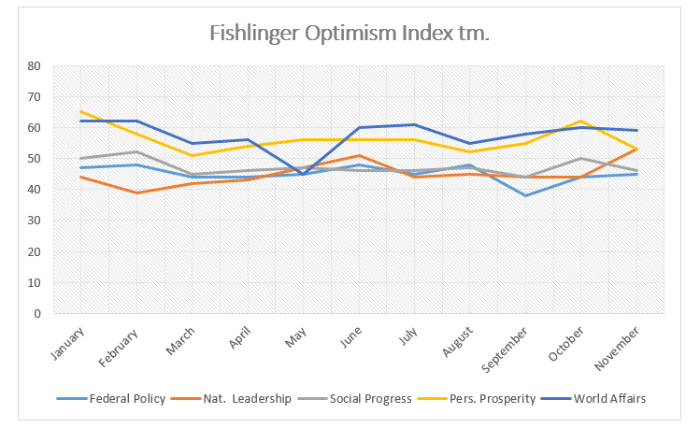 In this study, the Fishlinger Center conducted online national surveys focusing on political issues in the United States. The fieldwork for the poll was conducted using a blended national panel form Survey Sampling, Inc. Interviews were conducted November 1-30, 2018. The credibility interval for 1,000 respondents is plus or minus four percentage points. The credibility interval is larger for subgroups and for differences between polls.